Mihlton Barcelona is a modern establishment ideally located just 15 minutes by foot from Plaza de Cataluña and 100 metres from the underground station of Diagonal Avenue. The hotel has an elegant décor and take care of even the smallest detail to offer their guests a unique space to rest and escape from daily stress. A delicious continental breakfast to our guests, with the best regional products. You can have fresh fruit, daily baked bread, a wide variety of “embotits” (cured meats) and cheese, and a selection of the best desserts. The best way to start the day with. . There is also a large terrace and a gallery at the guest house. A wide range of dining options and bars can be found in the immediate area. Free Wi-Fi connection is also available throughout the property. 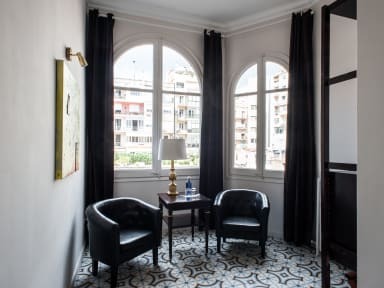 Mihlton Barcelona is a modern establishment ideally located just 15 minutes by foot from Plaza de Cataluña and 100 metres from the underground station of Diagonal Avenue. Perfect location for those who want to relax and enjoy the richness of the city. Mihlton Barcelona offers excellent connections in Barcelona. In a few minutes, you will be able to get to the main tourist attractions or to Barcelona’s airport just by taking the public transport. For more information, please do not hesitate to contact the property. The property offers a wide range of private accommodation for all. The rooms are the combination of comfortability and relax, each one with a unique decoration, in a smart and modern style. The property provides: air conditioning, WiFi without extra-charge, in addition to an en-suite bathroom with amenities and Hair-dryer. 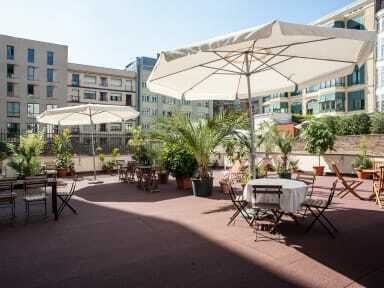 Some of them also has a balcony or terrace where our guests can stop to admire beautiful city views of Barcelona. Opening time from: 7 am to 11 pm. Please inform Mihlton Barcelona of your expected arrival time in advance. Taxes not included - Local occupancy tax 0.72 euros per person per night will apply for the first 7 nights. Child friendly. No additional beds are available.